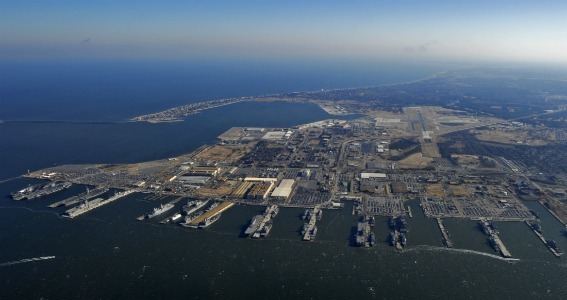 Naval Station Norfolk is the largest naval complex in the world! It supports the operational readiness of the US Atlantic Fleet. They provide facilities and services for missions and are committed to safety, security, and continuous improvement in quality of life and quality of service for our Sailors and families. Naval Station Norfolk is located in the Southeastern corner of the Commonwealth of Virginia. It is in the Sewells Point area of the City of Norfolk. The area is often referred to as “Hampton Roads” which includes the cities Newport News, Hampton, Norfolk, Portsmouth, Virginia Beach, Chesapeake, and Suffolk. The land on which Naval Station Norfolk is located was originally the site of the 1907 Jamestown Exposition. During this exposition, high-ranking naval officers were consulted and favored the idea that this site was ideal for a naval base. A bill was passed in 1908 proposing that Congress appropriate $1 million for the purchase of the property and buildings, but it died when the Assistant Secretary of the Navy was given a choice between this property or a new coal ship. He replied that a new ship was an absolute necessity. Immediately after the United States entered World War I in April 1917, the Secretary of the Navy was persuaded to buy the property. A bill was passed for the purchase of 474 acres. It also set aside the sum of $1.6 million for development of the base, including piers, aviation facilities, storehouses, facilities for fuel, oil storage, a recruit training station, a submarine base, and recreation areas for fleet personnel. The next six months saw the establishment of the Fifth Naval Headquarters, the Naval Operating Base (NOB), Naval Training Station Naval Hospital, and Submarine Station. By Armistice Day, 1918, there were 34,000 enlisted men at the base. An airfield for seaplanes was established at the Naval Operating Base in October 1917. In August 1918 it was detached from NOB and became Naval Air Station (NAS) Hampton Roads. It was renamed NAS Norfolk in July 1921. During WW I the Navy concluded that the available land was insufficient. It was decided to fill a large part of the flats on the west and north by dredging the Elizabeth River to a depth sufficient for large ships to dock at NOB. During the fall and winter of 1917, approximately eight million cubic yards was dredged, moving the northern shoreline from along Dillingham Boulevard to approximately its current location. During the late thirties and early forties, much construction took place at the Naval Operating Base and Naval Air Station as war loomed on the horizon. New buildings and piers were constructed and new runways, hangars, and ramps were constructed for the large land planes and seaplanes flown by the Navy in World War II. In December 1942, recruit training at the base was discontinued in order to focus on advanced training for men going directly to the fleet. The Naval Operating Base and Naval Air Station, then collectively referred to as Naval Base Norfolk continued their significant role as the home of the Atlantic Fleet after World War II. In January 1953, Naval Operating Base Norfolk was renamed Naval Station Norfolk as part of a Navy effort to standardize base names. On February 5, 1999, NAS Norfolk was disestablished and Chambers Field became part of Naval Station Norfolk. Today, in addition to being the home for the Navy’s largest concentration of naval forces, Naval Station Norfolk also hosts personnel from the Marine Corps, Army,Air Force, and Coast Guard, and supports significant Joint missions as well. Naval Station Norfolk supports the operational readiness of the US Atlantic Fleet, providing facilities and services to enable mission accomplishment. We are committed to safety, security, and continuous improvement in quality of life and quality of service for our Sailors and families.